“Mango & Sago Smoothies” experience the refreshing frosty fun served with mango smoothies, a delectable taste of mango blended well with sago. Try it for only 110 Baht. “Sticky Rice & Mango Crepe” snug in chocolate, a mango and sticky rice wrap served with coconut ice cream, vanilla sauce and a generous sprinkle of blueberry topping. Another specialty your sweet tooth should not miss for only 195 Baht. These two delicacies are recommended to be served together. Why not have both? 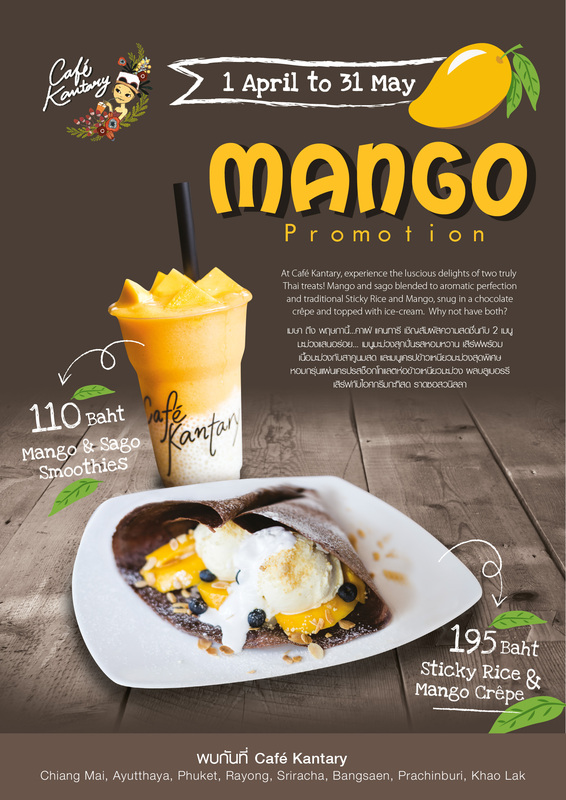 Enjoy both Mango Promotion specials at all Café Kantary locations: Chiang Mai, Ayutthaya, Rayong, Khao Lak, Phuket, Prachinburi, Bangsaen and Sriracha. วันที่ 29 มีนาคม 2559 เวลา 20:31 น.